Barry and Mina have welcomed guests from all corners of the world since first opening their doors in December `95. Many of these guests have become good friends. Barry and Mina Thomas have welcomed guests from all corners of the world since first opening their doors in December 1995. Many of these guests have become close friends and many return frequently. Mina speaks English, German, Hungarian, Hebrew and Afrikaans and Barry speaks some French. Wi Fi is available throughout the guest house free of charge. Smoking is allowed in the garden. All the rooms are non smoking, as per SA legislation. Our guests are welcome to enjoy our lounge, breakfast room, our sunny courtyard, and our tranquil garden whenever they wish. We can help with car hire at very competitive rates. Mina’s history as a registered tour guide means that she can show you the best routes to take to enjoy all the Cape has to offer. We can also arrange scheduled tours (which fetch and return guests to our door), or private tours. For special occasions such as weddings, anniversaries, honeymoons, birthdays or any other excuse, Barry will do a `Sabrage` and open the Champagne bottle with a ceremonial Machete, the one he used on his adventure driving from England to Cape Town. Breakfast is served from 8.00 to 10.00am in the Breakfast Room and Courtyard. It is a Buffet Breakfast consisting of cereals, yoghurts, a selection of cheeses and cream cheeses. A platter of cold meats, a platter of freshly cut seasonal fruit, home made stewed fruit, fruit juice, Ceylon tea, herbal teas, freshly brewed coffee, muffins and a variety of seeded rolls, brown rolls, croissants, low GI seed loaf and white bread. Barry goes to the local Bakery every morning to fetch freshly baked bread, rolls and croissants. The Victorian style home was originally built circa 1885. It stretches between two streets – Pine Road and Grove Road in Green Point. Green Point main road runs nearby, allowing rapid, easy access to us. However, Jambo Guest House nestles in a quiet, cobbled cul-de-sac at the foot of Signal Hill and is very quiet and peaceful. During 2011/12 Jambo Guest House was featured in a very special book. The book is: “Unique and Unusual Overnight Directory” compiled by Steve Dobson. Website: www.unusualhotelsoftheworld.com We are the only property in South Africa featured in this book. We highly recommend this publication as we ourselves would love to visit many of the hotels in it. So What Really Does Set A Guest House Apart? And, of course, this lead to the inevitable challenge: ‘OK, genius, so what DOES set a guest house apart? So let me draw your attention to a place I’ve recently enjoyed. Jambo Guest House in Greenpoint, Cape Town. Barry and Mina Thomas have filled their unusual guest house with an eclectic collection of art – much of which is local (and for sale) – and there are piles of books and collections of things wherever you look. And all the bedrooms are decorated individually (I’d call the one we had ‘Cape Regal’ – two huge beds, an oaken wardrobe, comfortable couch, one of those wonderful showers that massage you brutally…). And upstairs they have this pub where, they, told us, they often hold poetry evenings and the like. And it was in this comfortable Edwardian-style room that I met an author from Botswana – Bontekanye Botumile ( Bonty) – and we hatched an idea for a cross-border, cross-cultural publishing collaboration involving one of my children’s stories and lots of her brains. Watch this space. Jambo is a surprisingly quiet and serene place just metres off Main Road and right across the way from the new Green Point stadium. For us (we were there for the Cape Town Book Fair) it was close enough to the International Convention Centre to offer a pleasant walk to work in the mornings – although we did indulge in taxis to bring us home at the end of the day. Note my use of the word ‘home:’ it felt more like staying at home than like staying in the 5-star guest house it is – and whilst that might not appeal to everyone, it appeals to me. … But that’s just the point, isn’t it? Barry and Mina Thomas at Jambo haven’t tried to be all things to all men. Instead (because being all things to all men almost always fails) they’ve used their talents to create their own personal spaces. And those, I think, are the two words that answer my question… what sets a guest house apart is whether or not it has its own sense of personal space. I’m pretty sure it’s that simple. They have painstakingly designed and decorated each room on a different theme; e.g. the African room, the Green Room etc. We liked the place so much, we went back later to stay another couple of nights. It’s fantastic! Cape Town is an amazing place to live in. According to the British Sunday Telegraph it was listed as one of the places you have to visit before you die. More recently, Table Mountain was named as one of the “New 7 Wonders of the World”. (The whole area around us is safe to walk, at any time of day or night). The Victoria & Alfred Waterfront is but a 1 Km safe walk away. The Hop on Hop off Bus Station is very close. We highly recommend both Routes. The Urban Park and the Seafront Promenade, where one can walk or jog. Both the park and the promenade have exercise equipment areas. A string of excellent Restaurants are within a few minutes walk. Virgin Active Health Club and Gymnasium is across the road. The City Centre is half an hour walk, or a 4 minute ride away with many places of interest to visit. Please contact us if you have any questions or queries. 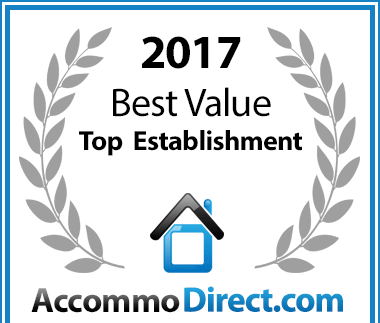 Jambo Guest House has been voted a Best Value Establishment for Guest Houses in Cape Town.